While generations before us may have shrugged off bullying as a part of life, we know that its effects are serious. No one at any age should be the target of repeated unwanted aggression, but school-aged children are most vulnerable. Bullies are powerful, or so they seem to the victims. Bullies use their physical strength or privy knowledge or even their social status to bring harm to others. Chronic behaviors such as threatening others, physically or verbally attacking others, spreading rumors, and excluding individuals from a group are commonly displayed by bullies. Such abuse has long-term effects on young victims. These effects include having low self-esteem, living in isolation, dropping out of school, experiencing health problems, and even committing suicide. Those who bully others face long-term effects, as well. Bullies can be more likely to abuse substances. In addition to this, they may cause harm to people, animals, and property. The effects of bullying seem endless, and not even the witnesses are undaunted. Those who bear witness to these injustices are also more likely to engage in substance abuse, miss more school, and experience mental health problems like anxiety and depression. Anyone can find himself or herself in the crosshairs of the bully; however, some people display certain risk factors that make them more likely to be a bully's target. 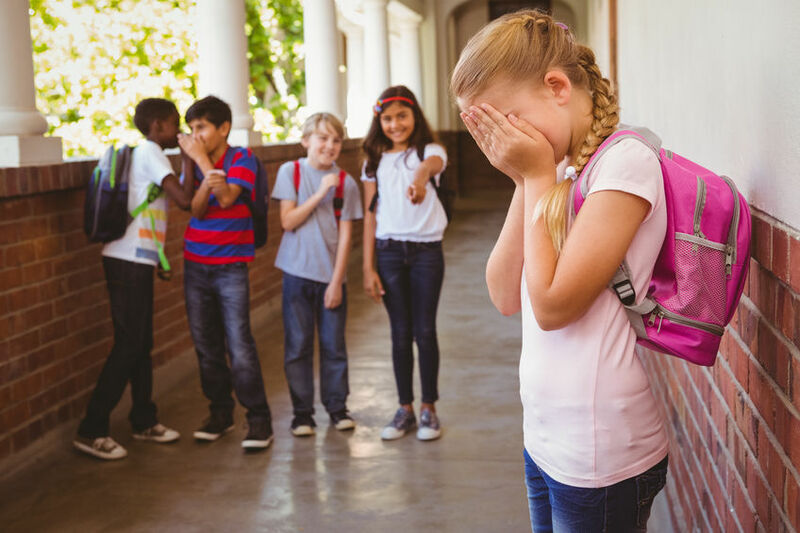 Bullies tend to hone in on those who seem a bit different from their peers: they may be overweight, wear glasses, be taller than others. Physical differences may make someone stand out to a bully, but bullies also pick on those who seem weak or depressed or those who are less popular among peers. Even being new to a school could put a child at risk. Still, a child may have such risk factors and never be bothered once by a bully. Whether your child has been the victim of bullying or not, it is imperative that you teach them how to respond when a bullying incident arises. Use the following tips to help your child protect himself or herself. They may even help your child protect another peer. All bullying complaints should be taken seriously. Never dismiss your child's complaints about a bully. What seems small to you may be filling your child with fear. Likewise, be an advocate for your child. You cannot expect your child to work through this trial alone. Praise your child for doing the right thing with regards to speaking up about the abusive incidents. Bullying situations should never go unreported. Make sure your child knows he or she can come to you about these problems and that you will take action to put an end to the issue. Include other adults as you address the situation. Discuss your child's reports of bullying with the teachers, counselors, principal, and other caregivers in contact with your child. You will find invaluable help when you work together with these trained professionals. Be cautious, too. Avoid directly contacting the bully or his or her parents. You have no way of knowing how they will respond when they hear the report. Talk to your child about how he or she is treated by peers. Ask specific questions about what it is like in the school hallways during passing periods or how kids interact at lunch or on the playground and bus. Find out who your child socializes with during lunch. Inquire about how your child and his or her peers treat other children. Teach your child the difference between being assertive and aggressive. When a bully confronts your child, your child must be able to state his or her needs and feelings about the situation without yelling or displaying aggression. Create opportunities for new friendships to form. Find sports, clubs, or other group activities geared toward your child's interests. Making new friends while doing what one loves is a sure way to boost self-esteem. Teach your child to identify behaviors associated with bullying. Your child should know it is not right to ignore hitting, damaging belongings, threatening, name-calling, ostracizing a peer, spreading rumors or embarrassing others. No child should do these things to another. Help your child devise tactics for managing the bullying situation. Your child can learn to walk away, tell the bully to stop, or report the incident to an adult. Similar tactics can be used if your child witnesses a bullying incident. He or she can assist the victim in walking away, invite the victim to join him or her at lunch or on the playground. Practice these tactics by role-playing. Inform your child that you do not condone bullying behavior. Work with your child's teachers, counselors, and other caregivers to end the bullying if you learn that your child has been bullying others. Be a positive role model. Always keep your decorum when disciplining your child. Never threaten or use aggression to do this. Behave the same when you are interacting with adults, as well.